What we commonly call Crucifix Orchids are species such as Epidedrum radicans, cochleatum and secundum which all provide long lasting flowers and can easily be grown in pots. With over 1000 identified species they are a large and varied group of orchids, ranging from species that grow in coastal forests to those that grow at much higher elevations. With such a diverse natural habitat growing conditions including temperature requirements will differ and species specific growing notes should be obtained from growers at the time of purchase. 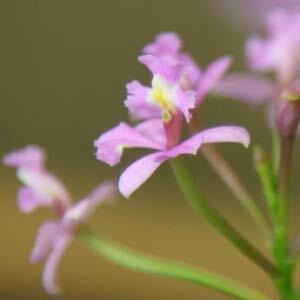 Most Epidendrum species are sometimes referred to as Crucifix orchids. Epidendrum nocturnum, Epidendrum porpax alba and Epidendrum garcianum, Epidendrum secundum, Epidendrum radicans and Epidendrum cinnabarinum are other popular species. Pictured right is the lovely pink flowering Epidendrum imatophyllum. Crucifix Orchids and most epidendrum species with their long lasting flowers are fairly easy to grow, although not common in Australia at present. Water epidendrum orchids well especially during the warmer months. A well drained potting mix is best, however epidendrums are tough as long as the drainage is good. Clay pots are popular with epidendrum growers as they drain well, but remember to repot regularly to prevent a build up up of salt residue from fertilizers. Although Crucifix Orchids do sometimes set seed, it is not that often. propagation from seed is possible, usually carried out in orchid labs in sterile conditions. They will make offsets or ‘Keiki’, and this is the more usual, and easier method of propagation for the home gardener. This is when the plant sets ariel roots, (adventitous roots). A cutting can be taken and this section potted on.